Tyler Lockett has good reason to feel connected to the California family. And he has a message for his namesake: "If you’re going to be a Lockett, you gotta keep fighting." Music thumped in the locker room. Wearing a hat declaring the Seahawks NFC West champs after crushing the Rams last December, Tyler Lockett asked to record a video. 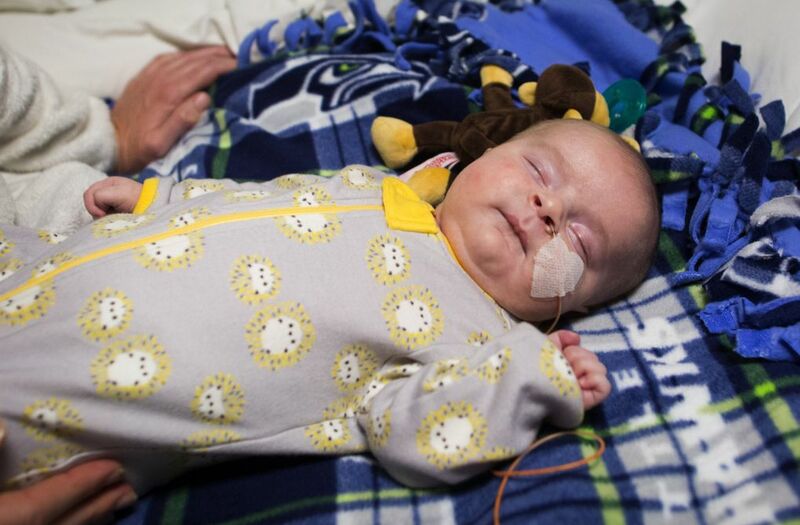 Lockett knew I’d been working on a story about a family in California whose 2-month-old son had, even before he was born, faced an onslaught of health problems. The baby was on dialysis and would soon need a kidney transplant. Lockett had never met the family, but had good reason to feel an unlikely connection with them: After reading a story about Tyler last summer, they had named their son Lockett. As Tyler slid on his socks and shoes, he looked up. “What’s up, Baby Lockett?” he said. 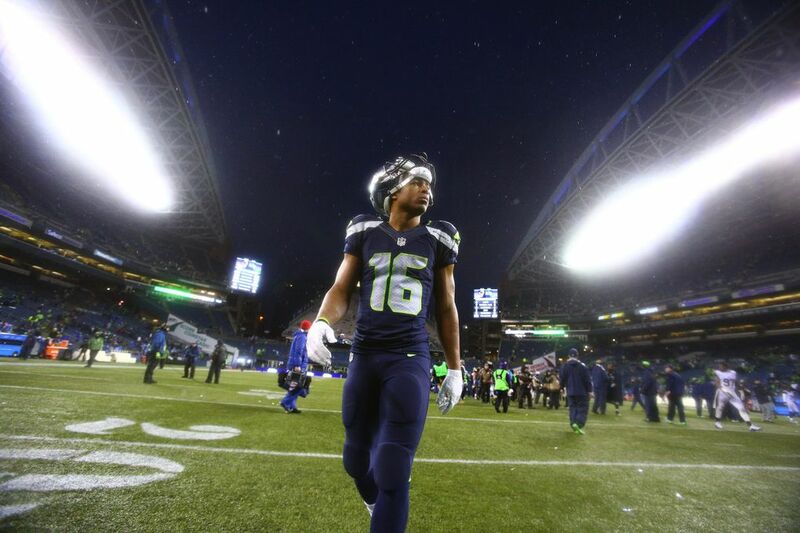 “This is Tyler Lockett. We just won the NFC West. It was a great game. I heard you watched me when I scored that touchdown. Maybe you can teach me how to do some dance moves. I gotta learn, I gotta get better. But hope everything is going (well) with you. Continue to keep fighting. Do your thing. Josh and Tara Schwerdt almost skipped the level two sonogram. It was such a routine part of their first pregnancy two years earlier that they questioned its necessity. The couple lived in Redding, Calif., and decided to make the 2½-hour drive to Sacramento because their insurance covered it. Another box checked. By chance, the same doctor who delivered the results of the level two sonogram for their first child, Atticus, also delivered the results this time. It was June 14, 2016. Right away, they knew something was wrong. Where once the doctor had been light and playful, she was now all business. She explained that the baby’s kidneys weren’t functioning properly and detailed the challenges the baby would face. She even mentioned terminating the pregnancy. Josh and Tara made the first of many silent drives home. It was supposed to be a routine exam, another part of the NFL’s draft process. Tyler Lockett arrived at the combine in 2015 closer than ever to the NFL and went through the usual tests. “Literally at the doorstep of his dream,” his father, Kevin, said. Tyler had grown up around football. Kevin played in the NFL and had set receiving records at Kansas State. Tyler’s uncle, Aaron, also owned school records. Tyler followed them to K-State, and initially students nicknamed him Baby Lockett. But after his 4-year career, he had smashed his dad and uncle’s records and was a coveted NFL prospect. While undergoing medical checks at the combine, a doctor noticed Tyler’s aorta was on the right side of his heart. Immediately Tyler focused on the worst-case scenario: That he wouldn’t be able to play in the NFL. Eventually Tyler learned his condition was benign, but the threat of losing football registered. In August 2016, ESPN.com wrote a story about Lockett’s combine scare. The Schwerdts were in the process of picking names. Josh had thrown out Lockett; he was a huge Seahawks fan and liked the way it looked in stories. Tara thought it was cheesy. But when Josh sent her the ESPN story, she changed her mind. On Oct. 9, Josh opened birthday presents in Tara’s room at the Stanford Children’s Hospital: a Seahawks sweatshirt, Seahawks shirt and Seahawks slippers. He and Tara ate cupcakes from their favorite bakery with Josh’s parents. It was the kind of morning that made Tara optimistic. Just three days earlier, the couple had given birth to Lockett. Lockett’s health in those first few days was stable, and the Schwerdts thought they might be able to return home soon. But later that day the hospital’s nephrology doctors informed Tara that Lockett would need dialysis and, eventually, a kidney transplant. He would undergo a vesicostomy and surgery to insert his catheter. Tara asked Josh to stay with her in her twin bed at the hospital. He tried to comfort her while she sobbed. Tara got up to pump breast milk even though doctors had cut off Lockett’s food before the surgery. She was still sore from the C-section, and Josh offered to store the milk for her, but Tara refused. She pushed a wheelchair down the hall so she could see Lockett. At 2 a.m., she held him and cried. Ten days later, she kept her hand on Lockett’s chest and faced the monitor. She wouldn’t leave his side. “I have never been so scared in my life!! !” she texted Josh. Three times that day, Tara watched Lockett stop breathing. The first time she noticed before the monitors did, before the alarms went off. Lockett had received two doses of morphine to keep him motionless while doctors inserted his central line in the jugular vein of his neck. 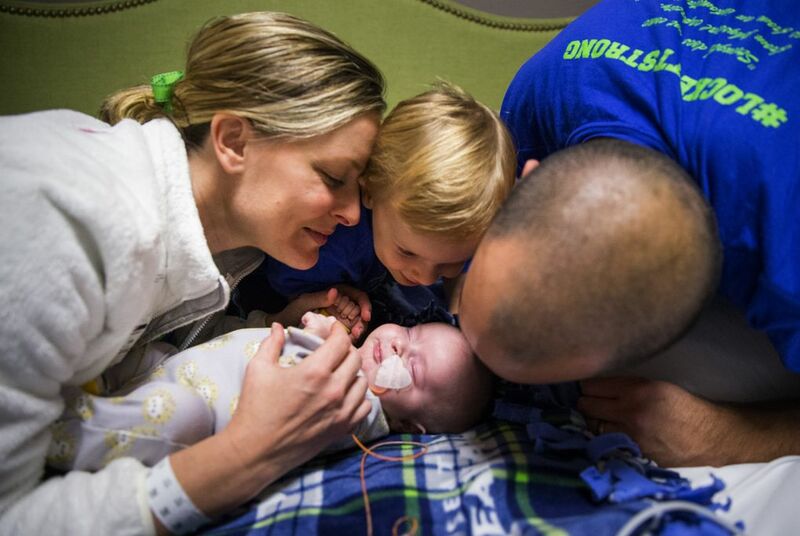 He returned to the neonatal intensive cure unit (NICU) and slept. Tara watched his chest rise and fall. Some moments remain clear in her mind, some details she will remember forever, but others exist only in a blur. Alarms. Lockett turning blue, then blueberry blue, then purple. We need a doctor stat to room four. Nurses and doctors, Tara backing against a wall, distant voices. Heart rate down to 52. Oxygen saturation down to 8. Shaking. Struggling to breathe. Her eyes never leaving her son. Twice more the alarms sounded that day: the doctors and nurses, the helplessness. At night, Tara refused to leave Lockett’s side. For some reason, when she packed her bag that morning, she included a “letters to your baby” book. She had bought it before Lockett was born and had planned to write if she had down time. If this was the last night she spent with her son, she wanted to show what she was feeling. In only 13 days, I have fallen so totally in love with you! I have carried you inside me and loved you while you grew in me. And now that you are here, I love you even more! Please keep fighting hard to be with Daddy & Atticus and I. Never give up! We will never give up on you! I will love you forever! Please keep fighting so we can all be home together soon! While Lockett’s condition stabilized, he endured an endless stream of tests, medication and complications. Adding to the challenge of his care was distance. 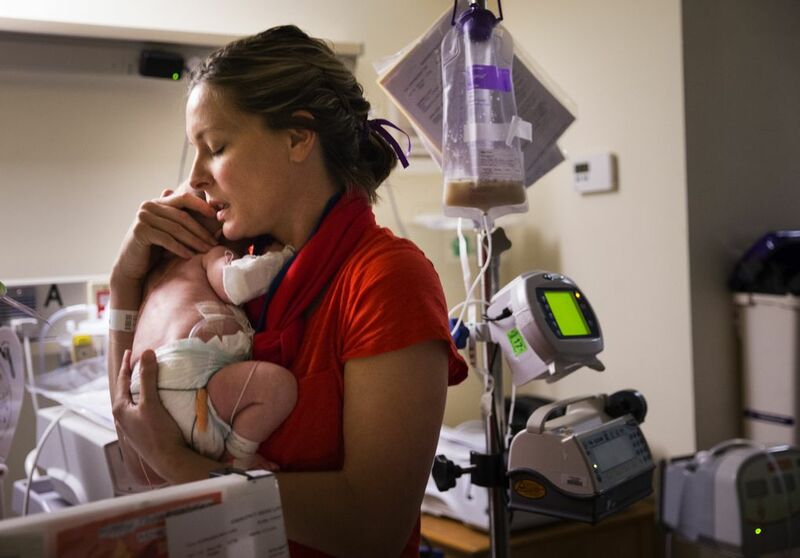 Tara remained in Palo Alto at the Ronald McDonald House just down the street from the hospital; Josh drove back and forth between the hospital and the family’s home in Redding, where he raised the couple’s 2-year-old son, Atticus. Tara missed Atticus, and they cried whenever they separated at the end of a weekend. Josh missed Lockett and rarely got to hold him. For Josh and Tara, they had almost no time for each other. One of the few ways they found normalcy was on Sundays, when they watched or tracked Seahawks games. Josh made Team Lockett shirts for friends and family. He later gave one to Tyler, who in turn sent the family a football. Josh and his dad love sports, and like many father-son relationships, they’ve bonded over the Seahawks. Josh wants that connection with his own sons. A rare quiet in the hospital. Tara wore a Seahawks jersey and wrapped Lockett in a Seahawks blanket. Josh slumped on the couch. The next day, Lockett would be discharged from the hospital. Just a week earlier, Josh and Tara had hoped to be home by Valentine’s Day. In a matter of only a few days, they had to finalize their training, order medical equipment, plan for his care at home and deal with emotional swings, from excitement to anxiety. Afforded an unusual quiet, Tara looked at Josh. The task ahead was nerve-racking. No longer would nurses and doctors administer Lockett’s care. Instead, his dialysis, feeding tube and medication would be handled by his parents. Their house was cluttered with unpacked medical supplies, and they hadn’t set up Lockett’s nursery. “I’m excited for our friends and family to meet Lockett,” Tara said. Tara cradled Lockett behind his shoulders. She scored high on the hospital’s post-partum depression questionnaire and felt overwhelmed whenever she thought about Lockett’s care. She hadn’t been home since Oct. 3 and worried how Atticus would handle a brother he’d hardly met. Beyond the practical difficulties of caring for Lockett — everything must be sterile when they change his dressing, for instance — one of Tara’s anxieties was balancing Lockett’s needs with those of Atticus. She worried that Lockett would demand so much energy that she and Josh wouldn’t have any left for Atticus. Tara is a planner, but Lockett’s care demanded she focus only on what was right in front. She knew the day of the week only by looking at her phone, and rarely went outside for more than 30 minutes. In the hospital room, Tara smothered Lockett’s forehead with kisses. For the first time in months they could look ahead with certainty. “I’m excited about going as a family and meeting your parents at Manhattan Bagel, our spot,” she said. The Seahawks played the Panthers at home that night. Lockett was scheduled to leave the hospital the next morning. It would be the first time he’d ever been outside. The Panthers game was the first night Josh and Tara had watched a game with Lockett, and Josh predicted that Tyler would score his first touchdown of the season. The hard thing for Josh is the unknown. With Atticus, he can fast-forward 20 years and picture a normal life. But it’s hard to do that with Lockett. 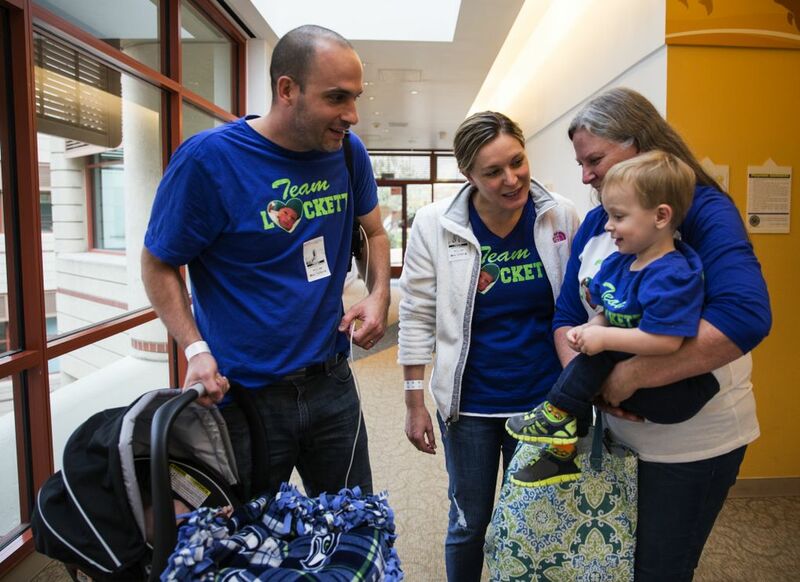 When Lockett is around 8 months old, he will go through the kidney-transplant evaluation. Josh and Tara will do the same. If they are matches, Lockett will have a kidney transplant as early as December, and as long as his body accepts one of their kidneys, his life will become normal. But if Tara and Josh aren’t matches, and if no other family members are matches, Lockett will be added to the transplant list. On the first play after halftime, Tyler took a hand­off and sped down the sideline. Josh shot off the couch and raised his fists. Tara was in the other room getting Lockett ready for bed. Josh poked his head in. His eyes got a little misty. Nicole Edwards, Tyler’s mom, woke up on Christmas Eve with a strange feeling. Later that day, Tyler and the Seahawks played the Cardinals, and Nicole began her game-day routine same as always: by praying for the health of every player on the Seahawks. Her unease remained at the stadium and as she watched Tyler nearly catch a touchdown in the first quarter. But in the second quarter, she had reason for her anxiety. Tyler caught a deep pass down the sideline, which at first was ruled a touchdown. Nicole, along with everyone else, celebrated. But Tyler stayed on the ground. Her first thought: I hope it’s not serious. Then she saw the replay and watched his leg buckle under a defensive player. Her second thought: How can I help my son? Tyler was carted off the field, and Nicole rushed to see him. Tyler was bummed. His season was over, and soon he would have surgery. Nicole tried to be confident and poised for him. 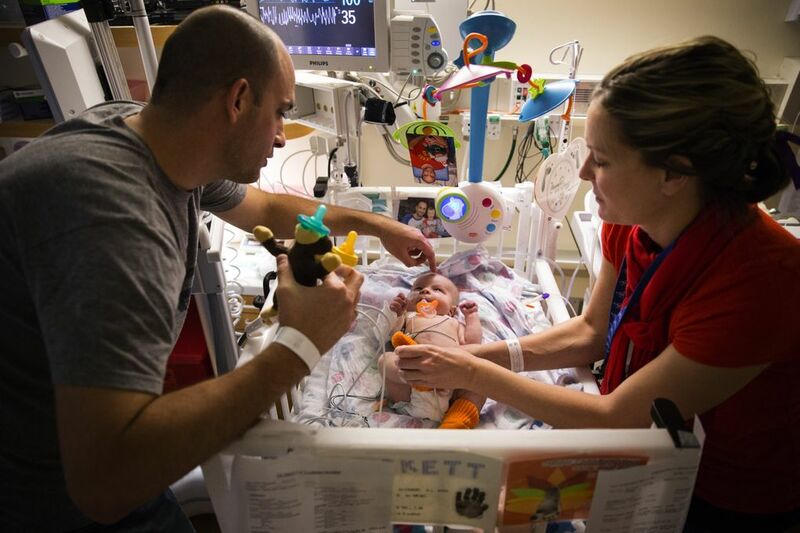 The next morning, Christmas morning, Nicole brought a few gifts to Tyler’s hospital room. icular, struggled with her fears. Lockett required constant care, which often meant that either Tara or Josh slept on a queen-size air mattress in his room. Tara’s nightmares jolted her awake. Sometimes she contaminated her son’s treatment and got him sick, or she was stranded and couldn’t hook him up to his dialysis. In her most morbid dreams, Lockett died. The first thing she always did when adrenaline kicked her awake was to stare at him: swaddled in a nest of blankets, feeding tube running through his nostril. If it was really dark, she leaned close to him. And if she still couldn’t tell, she reached her arm into the crib and put her hand on his chest, just to make sure she was still breathing. The kidney-transplant process will bring new hopes and fears for Josh and Tara. But back home on Christmas Eve, after Tyler caught the pass and Josh and Tara read the result of the play online, they were ecstatic. “Lockett and Lockett have some good mojo going!! !” Josh texted. When he found out what actually happened, Josh said he felt sick to his stomach. After the season, Josh and Tara had a request. They knew Tyler had started his grueling rehab process, and they wanted to film their own video, just as Tyler had done for them.